The ~177 acres of land that forms the LeVine Nature Preserve in the Town of Providence has served as a place to understand and appreciate the natural world for generations. The preserve was donated to Saratoga PLAN in 2002 by the LeVine family in memory of the late Dr. Milton LeVine, who purchased the property in 1968 so that he and his wife and sons could enjoy the many natural wonders that the land has to offer. For the past 12 years Saratoga PLAN has been honored to care for the property as countless visitors have enjoyed the land by means of its ~3 mile trail system. The preserve is nestled in the foothills of the Adirondack Park, and is rich with native flora & fauna, boasts two bustling creeks, miles of stone walls, and multiple cellar holes for the true nature explorer to discover. In an autobiography on his life, Dr LeVine wrote that he would leave the property to his boys hoping that it would serve as a “friend, companion, and source of solitude, reflection, contemplation, and contentment.” Now, this generous gift made by his family can provide these much needed values to everyone who visits and explores this truly special place. This preserve and trail are open to the public for nature study, walking, snowshoeing, and cross-country skiing. Please carry out all your trash and leave only footprints. Dogs must be leashed and under control at all times; please clean up after your pet. Please follow the rules so that these resources can continue to be accessible to the community. From Saratoga Springs: Take Route 29 west for 12 miles to Barkersville Road (You should see the Waterwheel Village Store on the far right corner). Turn right here and stay on Barkersville Road for 2.7 miles. The road will take several sharp turns, but stay on Barkersville Road (Route 16) until it intersects with Glenwild Road. Turn left on Glenwild Road, and after driving 1.4 miles, turn left on Centerline Road. 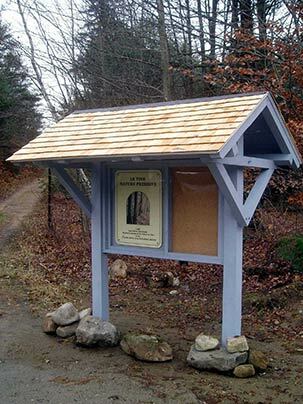 In approximately 0.8 miles, you will see the kiosk for the LeVine Preserve on the left side of Centerline Road. Parking for this preserve is along the road on a wide shoulder in front of the kiosk. The main trail that carries visitors through the LeVine Preserve was actually an old road at one time. The remaining trails that meander through the property were all planned and cut by some of Saratoga PLAN’s amazing volunteers!